You could use leftover ham from your Christmas dinner for this dish. You can also use leftover mashed potato, but if there has been milk added to the mash, you may need to add more flour. 1.Place the potatoes in a saucepan of salted water and bring to the boil. Reduce the heat and simmer for 12 to 15 minutes, until cooked through. Drain and mash but leave them a little chunky rather than like mashed potato. 2.Mix through the ham, Cheddar, flour and chives and shape into four potato cakes. Heat a large frying pan over a low heat and add the oil. Fry the potato cakes for 5 minutes on each side, until golden brown. 3. Meanwhile, to poach the eggs, bring a large, shallow pan of salted water to the boil and add the vinegar, then reduce the heat to a simmer. Break the eggs into the pan and simmer for 3 to 4 minutes, until cooked but still soft in the centre. Remove the eggs with a slotted spoon onto a piece of kitchen paper and drain well. 4. 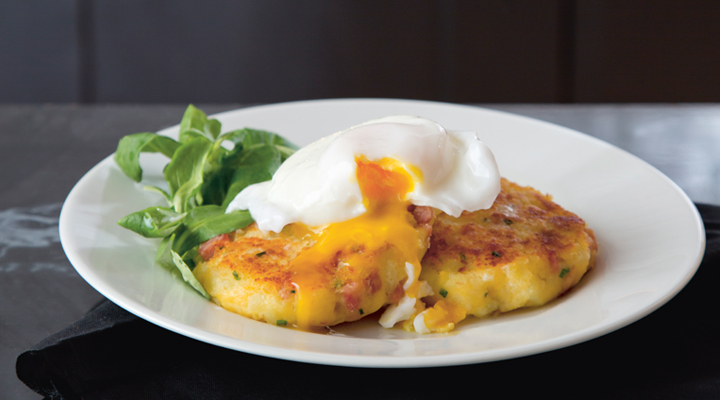 Place two potato cakes on each serving plate and top with an egg. Serve with watercress on the side.